I never won a Pepsi Prime when I was a kid but I don't remember trying. 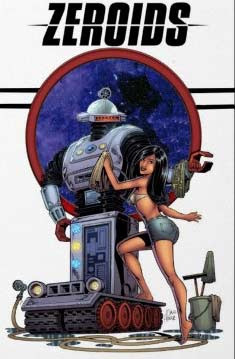 So Pepsi never got a chance back then to twist and pervert my love of Optimus into an addiction to their kidney caramelizer. I had to wait almost twenty years later to let them do that. I'm glad I got another shot. Hopefully Pepsi will keep alive their tradition of occasionally bringing me free Optimus Primes because ever since I turned 13 Santa Claus has been doing a really crappy job. 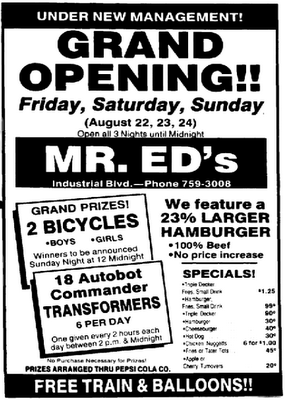 I found a couple of ads recently from food related establishments back in '86 who were giving away "Autobot Commander" Transformers. 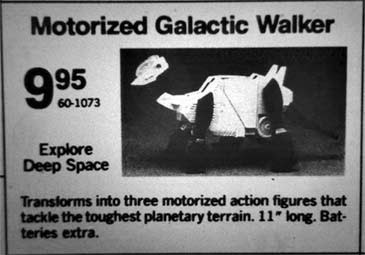 Although the stores differed, what they had in common was usually the robots were part of some random giveaway and multiples of these figures were raffled off along with some bicycles. 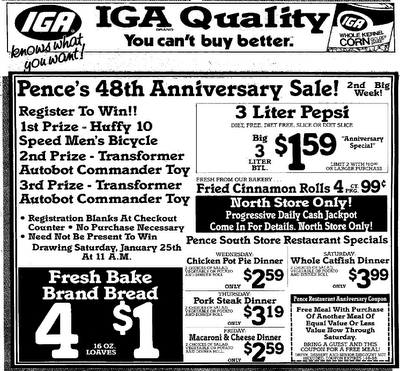 One ad was from a grocery store called Pence Foods doing a raffle where the second and third prizes were "Autobot Commander Transformers" and another one, from Mr. Ed's hamburger restaurant in Cumberland, Maryland, was part of a grand opening celebration. 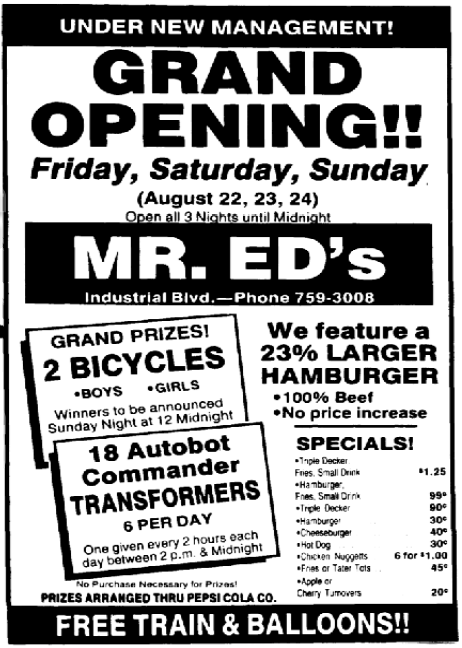 Mr. Ed's is the only ad I've found stating the prizes were furnished by Pepsi. 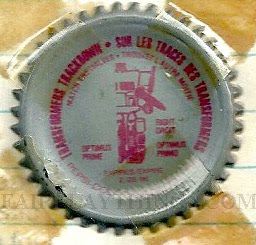 I'm thinking that in addition to the "look under the cap and win a Transformer" contest they did, they also gave away cases of Optimus Primes to various vendors to give away as promotional items. 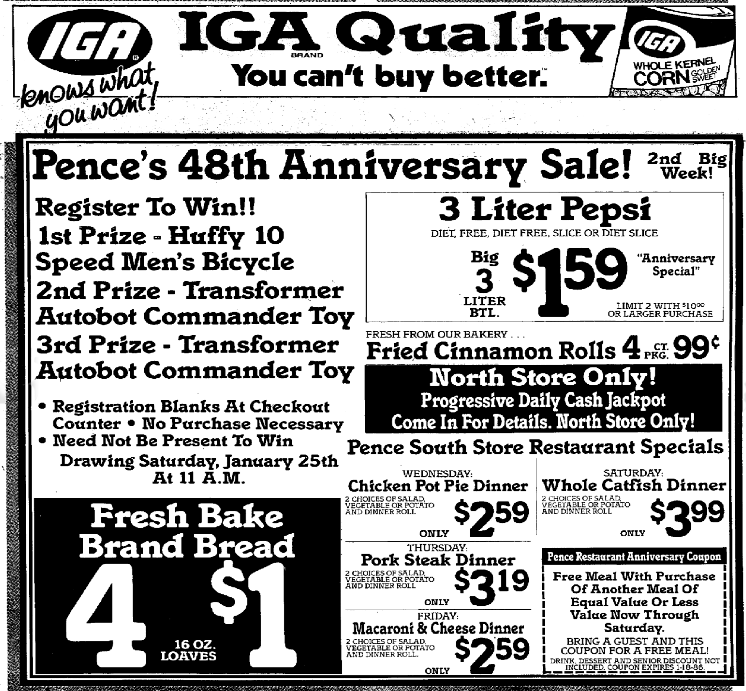 So there were probably lots of ways to score a Pepsi Prime beyond just the contest on the cans, which was the only official way I knew of. I say official because I had a friend whose dad worked for Pepsi and scored him one, in which case the only contest my friend had to win was the sperm lottery. The 12th seal of the Roboplastic Apocalypse severs and snaps like several zombie necks under the steady rumble of 40 year old robot tank treads in this "catching up with the Tronians" edition of the Roboplastic Podcastalypse! Listen in horror as the Nostrodomatron talks for over an hour about Yo Gabba Gabba (a new children's show about robots and monsters), Transformers G1 (an old children's cartoon about robots and monsters) and Zeroids (a new old comic definitely not for children, but still about robots and monsters). 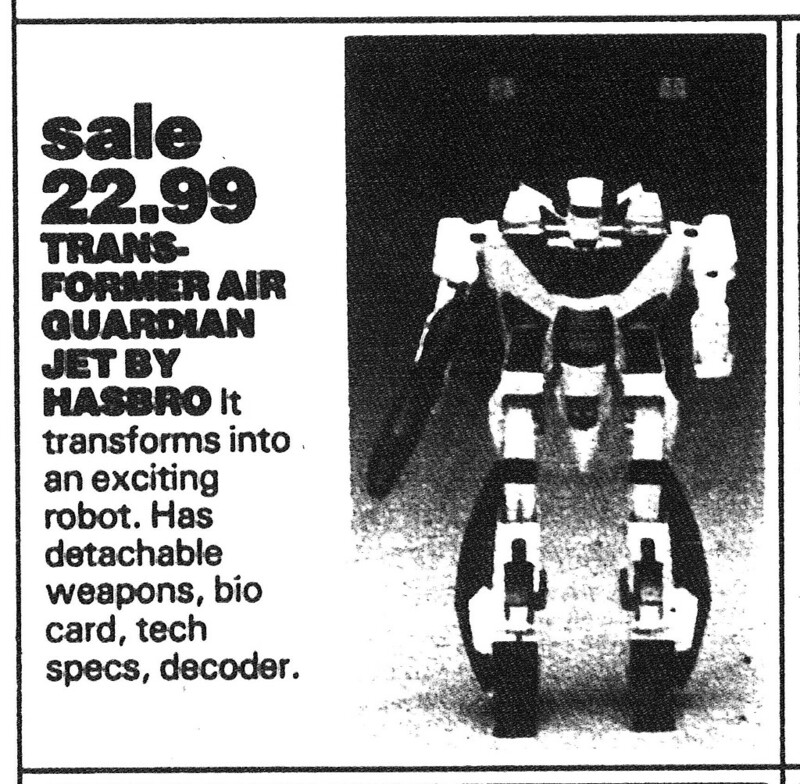 Plus old newspaper articles take me back to early 1984 when there was no Transformers bandwagon, everyone was jumping on the GoBots bandwagon, some people were jumping on the Robo Force bandwagon, and nobody even knew there was a Starriors bandwagon. 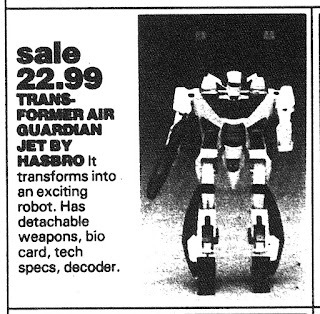 Do you remember the Roboplastic Apocalypse? YES I DO AND IT WAS REALLY FUN. I haven't figured out what these pictures mean yet but by showing you them I am hoping you will think I am some kind of an authority. Opening Poem-"We All Just Wanna be the Heroes of Our Own Flint Dille Novels"
Destroy All Podcastalypses Part 2!